Dan Gutman needs no introduction for anyone familiar with kids books--the Genius Files, My Weird School, and the Baseball card Adventure series have won him many young fans. 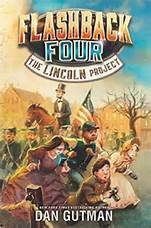 And now he is turning his attention to time travel with Flashback Four: The Lincoln Project (HarperCollins, upper elementary/younger middle grade, February 23, 2016). So four kids travelling back in time to an important moment in American history (in this case, the Gettysburg Address) isn't that remarkable a premise. But Gutman, as one might expect, makes it interesting. This is organized, planned, time travel with high tech science (and lots of funding) driving it. The four kids receive individual invitations to be part of it (although at first they don't know what the invitations are really for.....). A solid chunk of the beginning is setting up the whole How and Why and Where of the time travel, a reason is given for why kids were chosen to be the travelers (although there's no reason why these particular kids were picked), and they get coaching on 19th century idioms, food, and clothing. Their mission is not to change history, but simply to take a photo of Lincoln delivering the Gettysburg Address--nice and easy. Except it isn't easy. They arrive a day early, and one of the team members, Julia, gets somewhat distracted by thoughts of selling souvenirs on ebay, causing difficulties. They have no food and nowhere to stay. But they muddle through, and there they are, ready to point and shoot at Lincoln, and then things get really quite tricky when they arrested for attempted assassination. The tension doesn't last long, though, and they return safe home. It's a fun, easy time travel read, good for confidently reading second graders up to fifth grade or so. It's mostly entertainment, but there are a few little touches of thought provoking comment on the historical context. For instance, one of the four kids is black, and so we are given his reactions to certain events from the perspective of a position that is more dangerous than that of his white comrades. The inclusion of actual historical photographs (including one of dead soldiers lying on the battlefield, which is sad but not grotesque) adds educational interest and pleased primary source-loving me. Definitely one to give to the kid who loved the Magic Tree House books last year. I love Dan Gutman's baseball series and I love history, so I think I will check this out. Thanks for the review. I enjoyed this one as well. It was good that they had a mission just to take a photograph and not to save the world!